Da Capo Press, 9780306822261, 368pp. 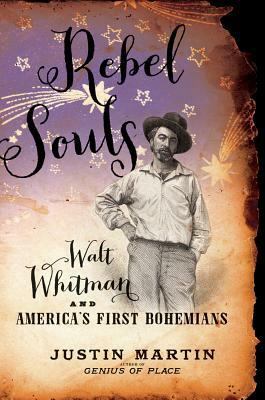 Rebel Souls is the first book ever written about the colorful group of artists- regulars at Pfaff's Saloon in Manhattan-rightly considered America's original Bohemians. Besides a young Whitman, the circle included actor Edwin Booth; trailblazing stand-up comic Artemus Ward; psychedelic drug pioneer and author Fitz Hugh Ludlow; and brazen performer Adah Menken, famous for her Naked Lady routine. Central to their times, the artists managed to forge connections with Ralph Waldo Emerson, Mark Twain, and even Abraham Lincoln. This vibrant tale, packed with original research, offers the pleasures of a great group biography like The Banquet Years or The Metaphysical Club. Justin Martin shows how this first bohemian culture-imported from Paris to a dingy Broadway saloon-seeded and nurtured an American tradition of rebel art that thrives to this day. Justin Martin is the author of three highly praised previous biographies: Greenspan: the Man behind Money, Nader: Crusader, Spoiler, Icon, and Genius of Place: The Life of Frederick Law Olmsted. As one of the few journalists to gain access to Greenspan, Martin produced a best-selling biography of the secretive Fed chairman, selected as a notable book by the New York Times Book Review. Martin's Nader biography served as a primary source for An Unreasonable Man , an Academy Awardnominated documentary. Genius of Place, the first full scale biography of Olmsted received glowing reviews nationally. Martin's articles have appeared in a variety of publications, including Fortune, Newsweek, and the San Francisco Chronicle . culture, a fascinating history that reverberates yet today. Thanks to Mr.